India just swore in its first robotic police officer, which is named KP-Bot. 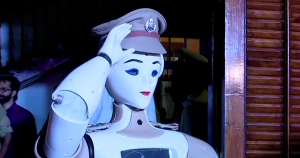 The animatronic-looking machine was granted the rank of sub-inspector on Tuesday, and it will operate the front desk of Thiruvananthapuram police headquarters, according to India Today. The robot was welcomed aboard with a salute from Pinarayi Vijayan, the Chief Minister of Kerala. India Today reports that the robot “responded with a perfect salute,” which presumably just means that it didn’t karate chop its own head off in the process. Aside from the symbolic gesture of integrating robotics into the police force, KP-Bot doesn’t do much. At the moment, it can sit behind a police station’s front desk, recording complaints and directing visitors to the correct department as needed. It can also salute at higher-ranked officers, according to India Today. In the future, it may be integrated with facial recognition software or the capability to detect bombs. KP-Bot is also for some reason gendered, with Assistant Deputy of police Manoj Abraham explicitly declaring that the inanimate object is a woman. The post India Just Swore in Its First Robot Police Officer appeared first on Futurism.